Portable, handheld devices consume little energy, but can deliver targeted light that renders common pathogens harmless. The Centers for Disease Control and Prevention (CDC) reports that one in every 25 hospital patients in the U.S. will contract a hospital-acquired infection (HAI) during their visit. Recent CDC reports show that progress is being made in HAI prevention, but there is still more work to be done. One opportunity to address the remaining gap in HAI reductions is to automate steps in the current point-of-care hygiene protocol with UV-enabled devices or by integrating ultraviolet C (UVC) disinfection with existing health care equipment. Medical equipment makers are leveraging much smaller UVC LEDs to develop portable and handheld disinfection devices to improve HAI-prevention protocols. From a disinfection standpoint, UVC LEDs are a major upgrade: They deliver targeted UVC light in the optimal disinfection wavelength range; have a compact footprint (you can place five on a penny and still have room to spare); and consume little energy, facilitating battery operation. Before a designer can create a new device, however, he or she must first address the key design parameter: the log reduction target, which is the relative number of live microbes that must be eliminated from a surface by disinfecting or cleaning. That in turn will determine the ideal UV dosage. For example, a “4-log reduction” lowers the number of micro-organisms by 10,000-fold. If a surface contains 10,000 pathogenic microbes, a 4-log reduction would reduce the number of micro-organisms to one. By establishing the log reduction requirement first, designers can determine the distance from the UV light source and the exposure time that’s needed to achieve it. Put another way, the distance from the UVC energy combined with the amount of time the surface is exposed to the UVC light will directly determine the level of disinfection. HAIs are caused by common pathogens. Each has a unique radiation absorption, or fingerprint; they absorb UV photons differently at different wavelengths based on their cell structure. 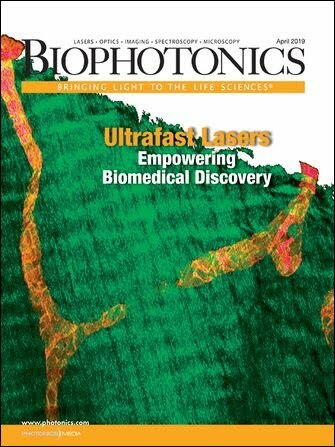 Absorbing UVC LED photons inactivates the pathogen’s DNA, rendering it harmless. While each pathogen absorbs radiant energy at different wavelengths, the UVC LED’s output range of 260 to 270 nm is the sweet spot for DNA inactivation. In addition, while traditional UV sources emit heat and light in a 360-degree pattern around the target, LEDs emit radiant energy in a single direction and shed heat in the other. As a result, LEDs can be placed close to a target surface. This is a major advantage in heat-sensitive health care applications. The question for designers is: How close and for how long? Experiments recently conducted at EMSL Analytical Inc., a third-party microbiological testing facility in New York, targeted common microbes for UVC LED disinfection applications (Table 1). The goal was to measure the level of disinfection achieved on different microbes across a range in gram-positive, gram-negative and fungi groups as a function of time and distance. Table 1. 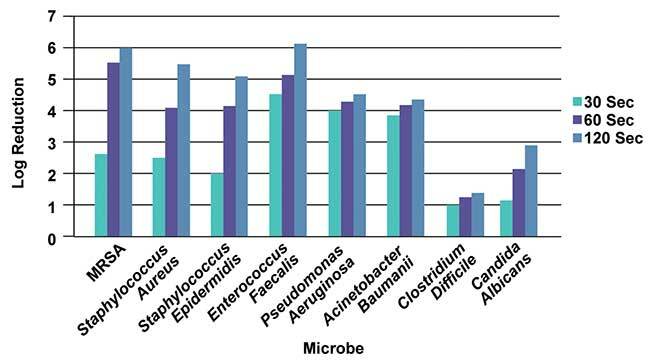 Common microbes for UVC disinfection applications. Courtesy of Crystal IS. The log reduction for each microbe was measured after being exposed to UV at 30-, 60- and 120-second intervals. After 120 seconds of exposure at 2 inches (Figure 1), there was slightly more than a 5.3-log reduction on all the gram-positive bacteria. There was a 6-log reduction for MRSA; bacteria of gram-negative types experienced a log reduction value between 4 and 5; spore-forming gram-positive experienced just over a 1-log reduction; and fungi had a log reduction value of approximately 3. Figure 1. Log reduction as a function of time for various microbes at 2-in. distance. Courtesy of Crystal IS. At a distance of 3.5 inches (Figure 2), the log reduction followed a similar trend, albeit less powerful, for the gram-negative and fungi microbes. The gram-positive and spore-forming gram-positive microbes saw a less-predictable pattern with the increase in distance. This may be attributed to the dosage required for complete inactivation of the microbe. Figure 2. Log reduction as a function of time for various microbes at 3.5-in. distance. Courtesy of Crystal IS. These experiments clearly demonstrate that when the distance is increased and time and UVC power are held constant, the log reduction is lower. However, this decrease in disinfection occurs in an unpredictable fashion, indicating that while dosage calculations will provide guidance on application design, true verification of log-reduction values must be validated through microbiology studies. Complete exposure of a surface will allow for delivery of the optimal UV dosage — making UVC LEDs ideal for disinfecting small or irregular-shaped surfaces or objects, such as surgical tools. By leveraging the LEDs’ smaller footprints, new disinfection devices can be developed to match the shape of the intended targets. Figure 3. Arrangement of LEDs that can be used for disinfection of vials (a), the optical modeling of the irradiation of the vial (b), and the irradiation pattern at the bottom of the vial (c). Courtesy of Crystal IS. LEDs can be used to disinfect two surfaces — a cylindrical vial and a small workstation (Figures 3 and 4). As UV disinfection is line-of-sight irradiation, the LEDs can be configured to deliver uniform light dispersion across two very different surfaces. A cylindrical vial (Figure 3) requires a dosage of 5 mJ/cm2, which must be achieved at the furthest point from the LED array — the base of the vial 81 mm from the light source. While the irradiation will be higher on the sidewalls near the top of the vial, delivering the minimum dosage to the base ensures the entire vial surface is disinfected. Based on the modeling data, this arrangement achieves the required dosage after 30 seconds. Figure 4. Arrangement for surface-disinfecting bar that can move along the axis (a) and radiation pattern from the LED onto a surface in stationary mode (b). Courtesy of Crystal IS. The disinfection of a workspace surface 100 mm wide (about 4 inches) requires a dosage of 12 mJ/cm2 (Figure 4). The LEDs are arranged in a 100-mm-wide strip of four UVC LEDs set approximately 25 mm above the surface. To achieve a uniform dispersion with the 100-degree viewing angle of the LEDs, they must be placed 25 mm apart in the array. The target dosage can be achieved by irradiating the surface for 30 seconds. Reduction of Clostridium difficile (C-diff). One of the highest-reported HAIs is Clostridium difficile, or C-diff. A remarkably resilient pathogen, C-diff can survive for weeks or months if left untreated and is easily transported into the hospital and from room to room on clothing and high-contact devices such as laptops, mobile phones, stethoscopes, workstations and diagnostic tools. Device surfaces are currently cleaned with isopropyl alcohol disinfection wipes that have an offensive odor, dry out the skin and damage equipment. With UVC LEDs, a quantified and trackable disinfection dose can be applied via portable or countertop devices — or integrated directly into portable work stations and diagnostic equipment — to disinfect surfaces as hospital staff move between patient rooms. CLABSI. While the CDC reported a 50 percent reduction in central line-associated blood stream infections (CLABSI) between 2008 and 2014, recent improvements have been less dramatic, prompting a review of where steps need to be added or enhanced. The approach for preparing catheter hubs prior to accessing the catheter, known as the Scrub-the-Hub protocol, involves a 30-second scrub using alcohol and friction coupled with a 30-second dry time to be effective. Disinfecting the hub is a 100 percent manual process with no verifiable means of compliance and takes up to 60 seconds if/when executed properly. If either step is skipped or shortchanged because of human error, harmful bacteria can be left behind. A handheld LED device attached to an infuser, on the other hand, could be aimed at the hub and deliver a consistent, trackable UVC dose capable of 4-log reduction of MRSA in less than 60 seconds (Figure 1). Catheter Tract Infections. Roughly 15 to 25 percent of hospitalized patients receive urinary catheters during their stay, and catheter-associated urinary tract infections, or CA-UTIs, account for up to 40 percent of HAIs. With high incidence rates and multiple access points for bacteria to enter the body, proper disinfection — especially at home — using a simple LED-equipped handheld device to administer a quantified disinfection dosage would help prevent intraluminal contamination. Ventilator-Associated Pneumonia (VAP). Ventilator-associated pneumonia, or VAP, occurs in only 1 to 2 percent of patients using mechanical ventilators. Unfortunately, VAP mortality rates are greater than 50 percent. Directed UVC light from a handheld device could disinfect complex passageways, in vitro components and even nebulizer equipment in situ without heating the target surfaces. This approach could be extended to a broad array of products addressing respiratory-associated illnesses, including continuous positive airway pressure masks (CPAP) that help millions manage sleep apnea disorder. According to the CDC, microorganisms and viruses continue to develop new resistance mechanisms that help them evade the effect of antimicrobials and antivirals, suggesting many have become resistant to almost every available means of chemical treatment. That’s why global spending on infection control, which includes chemical and physical disinfection equipment, is projected to grow at a compound annual growth rate of 6.5 percent, reaching 17.78 billion by 2021. Not surprisingly, the fastest-growing segment includes new disinfection systems and devices, including those that employ UVC LEDs, with hospitals representing the largest- and fastest-growing group of end users. Health care providers, medical device OEMs and disinfection equipment manufacturers alike have every reason to embrace smaller, portable devices that employ solid-state technology such as UVC LEDs. Doing so will significantly bolster what’s projected to be a long and difficult fight against the spread of infectious diseases and the ongoing emergence of chemical-resistant super bugs. Rajul Randive is the director of application development at Crystal IS. He is responsible for designing, building and testing various prototype applications that use Crystal IS UVC LEDs; email: randive@cisuvc.com.